Our shared vision of providing the highest quality care to our patients will make uniting our offices a success. Dr. Joel Stokes of Eastern Canyon Dental, today announced a long-term partnership with Perfect Smile Dental, beginning January 1, 2019. 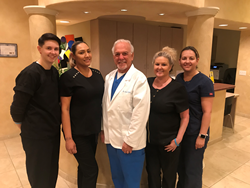 Under the terms of the partnership, Dr. Joel Stokes practice - Eastern Canyon Dental, his staff; and patients will move to Perfect Smile Dental’s offices and become known by that name. The partnership aims to enhance patient experience and expand availability. Starting in the new year, all Eastern Canyon patient records will be automatically forwarded to Perfect Smile Dental, and all patients will be referred to Perfect Smile Dental’s office, located less than one mile down the street at 8965 S. Eastern Ave., Suite 100. All patients will be able to see Dr. Stokes and members of his team at the new office. Dr. Stokes, who dreamt of becoming a dentist since he was thirteen, received his training from the School of Dentistry at The University of The Pacific, San Francisco where he holds the title of Doctor of Dental Surgery. Dr. Stokes has completed hundreds of hours of continuing education, emphasizing in preventative, restorative and cosmetic dentistry. Former Eastern Canyon patients may visit Perfect Smile Dental’s website, http://www.perfectsmilelasvegas.com/ or call their office at (702) 387-6453 for more information or to book an appointment.